Whether you're considering an indoor or an outdoor commercial batting cage, the technologically advanced systems from ATEC® can meet your needs. With more than 40 years of service to the industry and hundreds of systems globally, ATEC® engineers have designed to the most demanding of operational requirements. Ask the experts who equip the Major League™ and many of the leading university programs in the country. The heart of the ATEC® system is the Casey® pitching machine, the Official On-Field Pitching Machine of Major League Baseball®. ATEC® offers performance, reliability and service. The SureFlo™ Soap Dispensing System reduces maintenance costs, assures a steady supply of soap and features a single 13,000-handwash soap cartridge that serves up to five Bobrick countertop B-822 soap dispensers. Tucked under the counter, the SureFlo™ cabinet provides a built-in 2,000-handwash reservoir to avoid running out of soap and unscheduled custodial calls. An LED light signals when a 30-second cartridge changeover is necessary. The sealed system eliminates soap contamination and uses 100 percent of soap. Bobrick B-822 soap dispensers are guaranteed for life when used only with Bobrick Soaps available as premium gold and value-priced pink lotion. RMT Aquatics manufactures an innovative line of portable pool and spa lifts to provide access to aquatic facilities for individuals with disabilities or mobility impairments. Lifts are available for pools, spas, cruise ships and docks. All lift products use electronic components that are powered by a 24-volt rechargeable battery. This combination insures that the lifts work every time you need them. The PAL-Portable Aquatic Lift is one of the only completely portable lifts available. It can be easily moved around the pool deck and is ideal for facilities with multiple pools. The Splash! is an easily removable and portable deck-mounted lift. Bench 136 is one of the many highlights in DuMor, Inc.'s line of superior-quality commercial site amenities. Made of heavy-duty, 10-gauge steel, this attractive bench is available in several durable finishes and features a perforated metal seat and sturdy 3-1/2-inch O.D. supports for embedment, surface mount or subfloor installation. DuMor also offers receptacles, tables, planters, ash urns, bike racks, grills, and custom design and fabrication options. Doty & Sons Concrete Products, Inc. has been manufacturing high-quality concrete products since 1948. The product line includes litter receptacles, cigarette urns and banks, benches, planters, bollards, table sets, and more. Custom concrete products are available. Finishes include exposed aggregate and sandblast finish. Special aggregates (including granite) and colors are available as well, and factory-direct discounts are offered. With an Atria/Garden Prairie aquatic enclosure, your facility can provide a safe swimming environment in both winter and summer. In addition to year-round appeal, an enclosed pool offers safety aspects including protecting the swimming area from intrusion and reducing accidents with controlled entry to the pool. It also protects against uncontrollable elements that pollute the air and outdoor pools causing possible health problems. For example, pesticides, herbicides or lawn fertilizers can be airborne and when carried into a pool create a residue causing contamination. With an enclosed pool, the environment is controlled without the concern or hazard of outside contaminants. 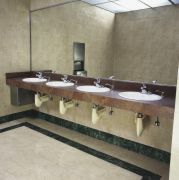 Romtec, Inc. offers complete restroom facilities with concession and storage rooms. These solid concrete structures handle the use—and abuse—common in public parks and recreation areas. The attractive, split-face concrete exterior resists graffiti and vandalism, while heavy-duty, steel-frame, Lexan gable windows admit natural light. The prefabricated, insulated steel-frame roof offers a choice of roofing and skylights, and commercial plumbing fixtures are available as stainless steel or china. Interior walls and vaulted ceilings feature a fiberglass reinforced polymer finish. Facilities have a stainless-steel concession counter and rollup window. Many sizes and styles are available, and all meet ADA guidelines. Star's Hot Food Merchandisers are effective for merchandising sandwiches, burritos, cookies or any day part menu items. Adjustable infinite temperature controls allow you to regulate day part menus up to 180 degrees Fahrenheit depending on menu requirements. A forced-air system circulates air throughout the cabinet, keeping menu items at the proper serving temperature. The 12-inch model has two perforated shelves that adjust to flat or angled positions for displaying a variety of day part foods. The 15-inch model has three perforated shelves for different display options. An interior light showcases products and builds impulse sales, while colorful graphics enhance appeal.